Has anyone dealt with this issue before? 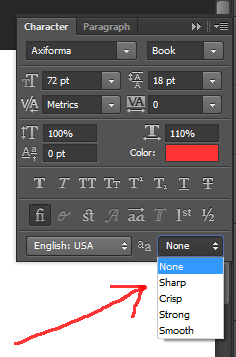 For some reason, my text on Photoshop is not smooth at all, no matter what font is picked. If anyone has any tips, would be highly recommended. Select your text then hit Ctrl+T to bring up the 'Character' panel and play with the anti-aliasing option until it looks right. Probably need to choose the 'Smooth' option. Not the answer you're looking for? Browse other questions tagged adobe-photoshop fonts text or ask your own question. Does anyone know how this kind of pixelated type is created?